Amy Shock is both a visual artist and an architect. This crossover of professions is evident through her sense of line, composition, scale, and attention to detail. Her oil paintings present abstractions of space and volume, recalling the early subject of modernism. 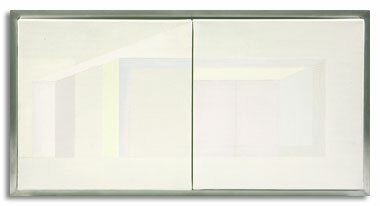 The influence of Dada, Duchamp, and the Bauhaus (literally meaning "house of construction") are visible in the minimalism and utilitarianism of her work. Her artwork has appeared in operas, films, and in a variety of commercials. Her stage design work includes the touring productions for James Taylor, Reba McEntire, Josh Groban, No Doubt, The Backstreet Boys, Michael Bolton, Lionel Richie, Jennifer Lopez and Bruce Springsteen. In 2010 she was commissioned to produce the series of paintings "Dingbat Buildings in LA". Amy Shock’s paintings are shown in Los Angeles and Ventura County.